Thanks for that, Andy. I thought the name was familiar. However, (I haven't done any research on 2/Lt. Blomfield), the initial also strikes me as if I should know him. As I said, I don't know what the "V" stands for, but the name "Victor Blomfield" rings a lot of bells. Any ideas? A response and a scan within a few minutes of asking the question! It would appear that 'my' man was one of those unfortunates on the receiving end of a tragedy whilst in a so-called quiet period. Thanks ever so much for looking this up. You came up trumps again, Dave! Many many thanks for this look up! Sorry for the tardy thanks, but I've been on holiday and am just working my way through unread messages - 9 pages!! Interests:The Border Regiment in the Great War, especially the 11th Battalion, the Lonsdales.<br /> Really, just about all aspects of the Great War. Always keen to learn more....<br />My kids, the Lonsdales, Carlisle United F.C. 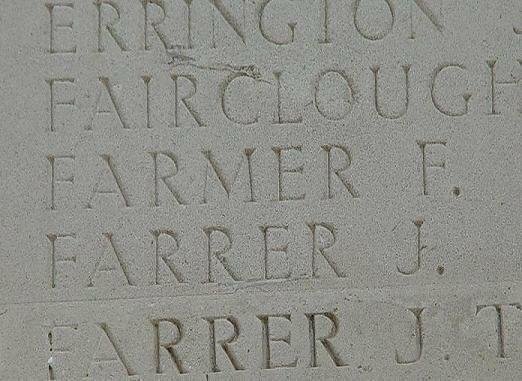 Dave-could you find the Lonsdale Battalion unit history for 1st July 1916-my great grandfather Pte John Farrer was a Lonsdale who was killed that morning. I would like to compare with the info I have in my article in his memory on Hellfire Corner as it was not researched from the unit history directly. I have only just joined this forum,so apologies for the late request. I am very interested in all aspects of the Lonsdales history and always like to add to my sources. Thanks very much-the info is much appreciated. 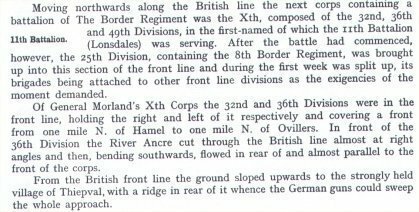 Not wanting to push it-but have you anything on the trench raid of June (5th ,I think) 1916 by Lt Barnes and a squad of Lonsdales on the area known as the Granatloch. I've filed your info with my other stuff on the Lonsdales. Lieutenant Barnes according to one of my sources -was killed returning to no- mans land to retrieve a revolver he had lost in the raid. A terrible waste, don't you think? Do you have the battalion history for the 11th Border Regiment for July 9th 1916? I've just read Blindfold and Alone-about the capital courts martials of the war and other disciplinary matters and in there was a passage about the Lonsdales.After suffering badly on July 1st-some survivors apparently refused to go on a trench raid(30 out of 90 reported sick),and their medical officer agreed they were unfit,due to their grevious losses only 9 days previous. 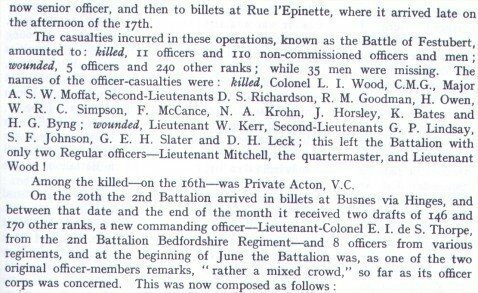 The net result was the Medical officer was discharged,and the men were sent on a raid-but they were reported to have" been reluctant to fully participate" by the officers(most of whom were new to the Battalion,due to losses incurred). The Lonsdale Battalion 1914-1918 by Colin Bardgett. Sorry Spike. I can't help you there. There's no specific mention of this date in the history. The page that is nearest, you already have ("page 2" of my posting on Sept.22nd) where it mentions the Lonsdales being relieved on the night of 3/4th July and playing no further part. You might be best off seeing if the Bn war diary mentions it? 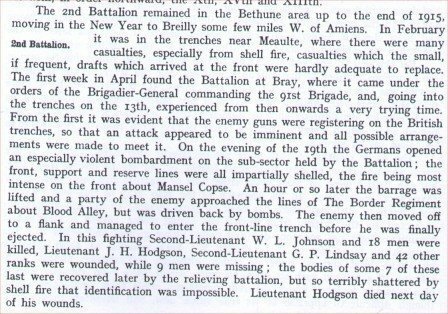 I have been able to find no other mention of such an incident anywhere.In fact most accounts suggest the Battalion was resting during the period. I kinda suspect the book in question was badly researched in this matter,though it does "namedrop" a 2nd Lieutenant Ross who was an officer at the time. Still,things can be covered by the mists of time-and some never let that get in the way of a good story. I agree with you there, Spike. To be honest, you can find innacuracies in most books written about the war, with different people seeing the same events differently, etc., and using different sources. Could you check your information on the Border Reg on the off chance this individual is mentioned? EJ McCarthy was an Imperial Army Reservist and was living in Fremantle, Western Australia when was was declared. The only piece of paper that I have on him has him joining up in the 5th Military District(Western Australia) for service in the Border Regiment. He joined on the 10/08/14 and his unit was the Border Regiment. His service number was 8335 and his rank on enlistment L/Cpl. His next of kin was his wife of Onslow Rd South Fremantle WA. I've checked CWGC and can find no trace of him so have assumed that he survived the war.